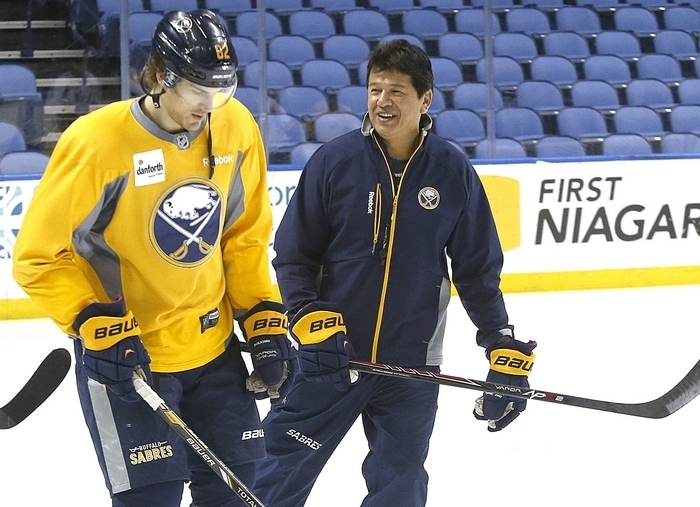 While watching Ted Nolan eke out overtime appearances with an overmatched hockey club, Sabres General Manager Tim Murray realized the coach should stick around Buffalo for three more years. Murray also noticed the most obvious truth of all. The Sabres’ hockey department, once the definition of stability, is on solid ground once again with Murray and Nolan in place. The next step for the GM is giving Nolan an NHL-caliber team to coach. It won’t be in place tonight when New Jersey visits First Niagara Center, but the sides share a vision of what kind of players should be on the team. It’s up to Murray to bring them in, to show them Buffalo is a worthy landing spot. “This is the first step,” Murray said after removing the interim tag Nolan had worn since November. “Free agents want to go to a team that has a chance to win, so we have to change that. No. 2, obviously, they like stability. They like to think that the people in charge can change that if you’re not there yet. “We have players here that were drafted or signed before him and I both got here. Some of them are NHL players, so we’re going to go forward with those guys. There’s some good young talent in the organization that I certainly had nothing to do with. He has had something to do with it because he’s got his hands on them between five games and 20 games, so he has had an impact on those guys. Nolan is looking forward to the day when the words “30th place” and “Sabres” are not synonymous. “When you have good players, it makes the game so much easier,” Nolan said in First Niagara Center. “You look at some of the teams we play and just their hockey intelligence gets them out of a lot of trouble. In order to have good players where we are, we have to develop those players, too, so I’m looking forward to that. There aren’t many Sabres assured of sticking around, but those who are enjoyed the news of Nolan’s contract extension. The players also like the renewed feeling of stability. The roster has been a mix of callups, acquisitions and waiver claims, while the front office and coaching staff have turned over like a restless sleeper. Nolan was set to sign the extension in February before the chaos erupted involving the departure of Pat LaFontaine, his friend and president of hockey operations. Nolan took a break to reassess the matter, and the contract has been in the hands of his agent for weeks. Murray determined through observation and conversation that he had the right guy to polish them. “He’s been in a lot of situations here that haven’t been great, and a lot of nights I’ve liked the way our team competed,” the GM said. “I like his back and forth with young players. I like his teaching with young players. I like patience with young players. We’re not all going to be young. Our veteran guys like playing for him, too, so that’s not pigeon-holing him as a young-guy coach. The job now is to make it a winning situation.